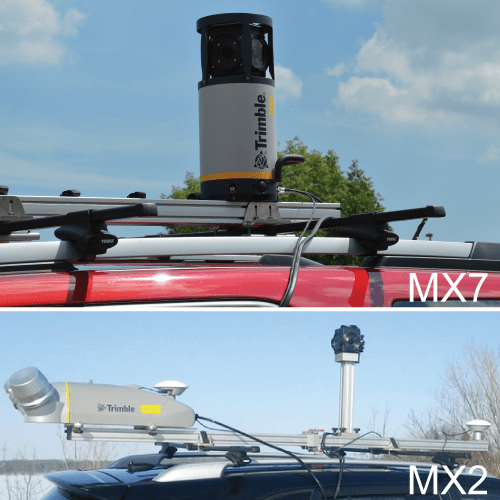 The Trimble MX2 – Versatile mobile survey grade with LiDAR mapping solution. High performance laser scanner captures fully synchronized point clouds. Simple to install on any on- and off-road vehicles, quad bikes and boats. Reduces project timescales through fast deployment, data capture, and analysis. The MX7 comes with (6) five-megapixel cameras, has a GNSS inertial referencing system, captures 360-degree panoramas with 30 megapixel at highway speeds and can process data fast. The MX7 makes any challenging project easy to map such as; bridges, highways, roads, power stations, corridor mapping, site inspections, inventory/asset data collection and more. Contact us to schedule a demonstration or rental inquiry. The MX2 is a vehicle mounted spatial imaging system is designed for mapping, surveying and engineering environments, the MX2 is rugged, lightweight and portable. It is also easily deployed and redeployed on projects similar to conventional surveying equipment. A precise laser scanner, along with an embedded Trimble-Applanix GNSS/Inertial positioning system, allows geospatial professionals to create the point cloud accuracy necessary for many spatial imaging projects. Accompanied by Trimble Trident software to capture, process and analyze point data, the MX2 offers a ready-to-use workflow for surveyors and professionals in mapping, engineering, planning, oil and gas, utilities, mining, environmental, public safety and more. The system is available in single and dual-laser versions. Check out the YouTube video to see how easy and quickly it can be deployed. Contact us to schedule a demonstration or rental inquiry.